GBPUSD continues to trend higher despite recent Brexit developments, according to David Sneddon, Pascal Zingg and James Gilbert at Credit Suisse in London. Sneddon and his team say a base is still in place above 1.2815 (see Chart) and that GBPUSD will likely target near-term resistance at 1.2895. They think a break above the recent high at 1.2930 will happen in due course, providing the opportunity for strength to extend further towards resistance at 1.2968/79, then 1.3072/77, and eventually the 200-day moving average and potential trend resistance at 1.3101/15. A break above this final level would open the door to a test of the 38.2% Fibonacci retracement of the fall from April at 1.3182. 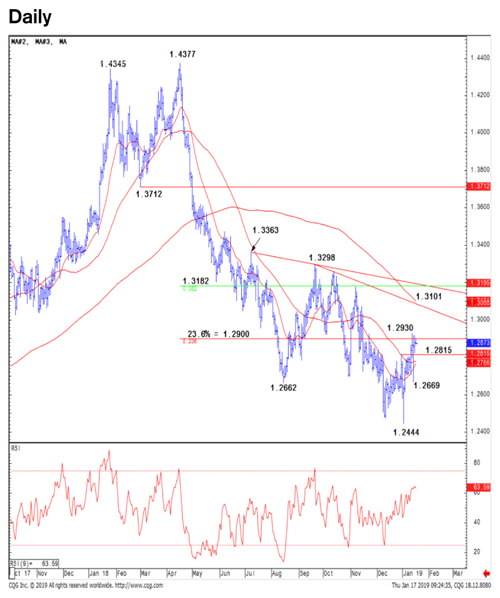 Sneddon, Zingg and Gilbert say support can be found at 1.2824 initially, then the 55-day moving average at 1.2780, which they think should ideally hold. Below this level, GBPUSD would likely retest key support of the low at 1.2669/62, removal of which would warn of a more important break lower and an end to their bullish outlook.